From Wiki: The White Tower is a keep (also known as a donjon), which was often the strongest structure in a medieval castle, and contained lodgings suitable for the lord – in this case the king or his representative. 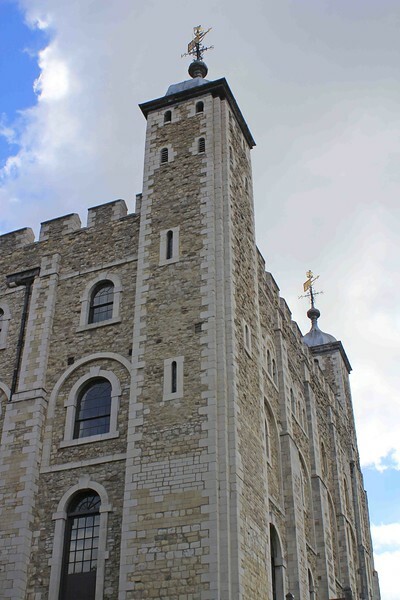 As one of the largest keeps in the Christian world, the White Tower has been described as "the most complete eleventh-century palace in Europe". The structure was originally three storeys high, comprising a basement floor, an entrance level, and an upper floor. The entrance, as is usual in Norman keeps, was above ground, in this case on the south face, and accessed via a wooden staircase which could be removed in the event of an attack. At the western corners of the building are square towers, while to the north-east a round tower houses a spiral staircase. At the south-east corner there is a larger semi-circular projection which accommodates the apse of the chapel. As the building was intended to be a comfortable residence as well as a stronghold, latrines were built into the walls, and four fireplaces provided warmth. The main building material is Kentish rag-stone, although some local mudstone was also used. Caen stone was imported from northern France to provide details in the Tower's facing, although little of the original material survives as it was replaced with Portland stone in the 17th and 18th centuries.